As promised, I have put together a tutorial for this notebook-pouch. It fits my daughter's computer, which measures 12" X 8", but you could easily modify the cutting instructions to fit a larger laptop, or smaller tablet. You can find the downloadable PDF instruction on Amy's blog, During Quiet Time. Amy is not only a paper-piecing super-star, but she is also the one behind the Little House on the Prairie Quilt-Along. This girl is talented! If you have questions about the tutorial, you can email me at freshsqueezedfabrics (at) gmail (dot) com. I finished up another notebook-pouch. With this one, I used Color Theory prints, and I am loving the grey and yellow together. It's not a color combination that is naturally "me", but it has definitely grown on me. I love to be surprised by color once in a while! A tutorial for this pouch is coming very soon! This week in my shop all US orders totaling $50 or more will receive free shipping in my Etsy shop! Simply use coupon code "fabriclove" at checkout. Click here to see all of the goodness in my shop! Have you had any time to work on something? If you have a sewing project in the works, you can share it here. Just starting something? Show your pile of possibilities. Half-way? Let us in on your progress. Finished! Good for you! I would love to see what you made. I made a pouch for my daughter's laptop yesterday. She has a small one that she totes around in her backpack--it only measures 12" X 8". I don't want it getting all scratched up, so a pouch was in order. She picked out a print from the Indelible Collection. This week in my shop Lulu Roses is 25% off! This beautiful vintage-y collection is perfect for quilts, totebags, and all manner of sewing projects. I am so excited to tell you about a new SEWING SEEDS project! A group of friends from my church is heading to Mexico next month to build houses in a poverty-stricken area, and they will also be visiting an orphanage. The people in this area have many needs, and I am hoping we can, as a group, help them out a little bit. Between now and March 13th, I will be collecting handmade skirts for girls and gently-used shorts for boys, for the missions team to take down and distribute. Some will be given out at the orphanage, and any extras will be passed out on the streets. So, this gives us just one month! If you would like to help out, please email me at sewingseedsfsf (at) gmail (dot) com and I will send you my address. You can send any amount of skirts and/or shorts. If you don't know what to send, I suggest that you send something that would fit your own kids/grandkids/nieces or nephews. That way you are blessing a child very similar to your own. Also, feel free to make something for an older child. I am thinking 14-16 would be the oldest. I want to thank you ahead of time for considering this. Sewing Seeds is my favorite thing to do here on my blog and it's been WAY to long since it's happened (has it really been almost 5 years????). My goal is to do this more often! Have a great day, friends! And please feel free to spread the word out this Sewing Seeds project on your blog or other social media. 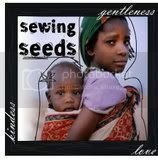 PS...the picture above was taken in Africa and it shows our first Sewing Seeds project. My daughter (in the picture) took 300 skirts with her to pass out to the community. I am guessing that none of you are surprised to see ruffles! It's like I can't stop! I should be done with these three aprons by the end of the week, so finished pics will be coming soon. I promise! All I need to do is find a model. This week in my shop RECOLLECTION by Katarina Roccella for Art Gallery Fabrics is on sale at 15% off! This is a beautiful, fresh collection with a wonderful variety of prints. This is what my yesterday looked like! Ruffles and ruffles and ruffles! Ruffles growing to kitchen aprons. And today will look the same. Gotta finish these lovelies. The top apron is made with Pam Kitty Garden yardage, and the two on the bottom (yet unruffled) are made with Recollection and Birch Farm. I have one thing to say: it's hard to take a picture of an apron without a model! So here is "half" hostess-apron. It's folded, so it looks kind of silly. But I do love it, just the same. This week I hope to find a model and give you all a better picture.